I'm loving the trend of interactive cards and today I made my first slider card - what fun. It is so exciting when the image actually slides and tumbles! 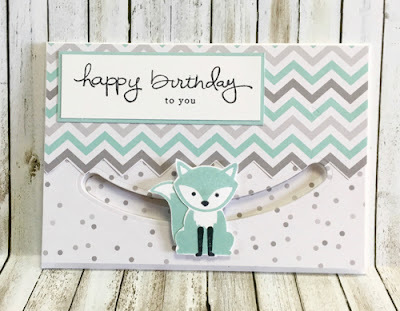 I used the Sliding Star Framelits by Stampin' Up!® and decided to branch out a little and use stamps that I already owned to create some different cards. 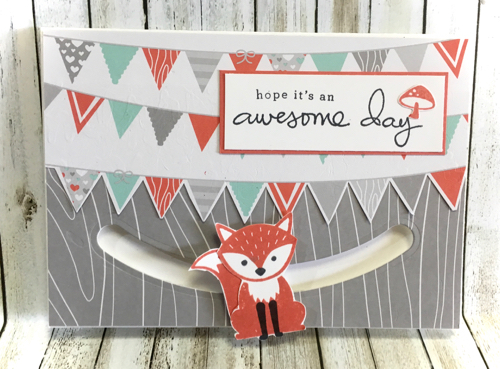 I also used the A Little Foxy Designer Series Paper Stack - a stack of coordinating papers 15.2 x 15.2 cm (6 inches square) to create quick, coordinated backgrounds. The first card uses the front and back of one sheet and I stamped the little fox in Pool Party with Memento Black details. The greeting is a combination of 3 stamps from the Endless Birthday Wishes Photopolymer stamp set. It is really good to be able to compose a greeting with the photopolymer stamps as you can see exactly what you will be getting. I also like the contrasts in the styles of script. The second card uses different colours with a dominance of Calypso Coral. Again this is the front and reverse of the one sheet of DSP. With both backgrounds I fussy cut along the design to give the background a bit of interest. You will notice that the fox tail has been cut and realigned closer to the fox body. I did this to keep the unit more compact and therefore more easily moved. I used washers and dimensionals as shown in the video by Stampin Up! and found that it is important to ensure the washers are placed exactly on top of each other. Here is a video of my card in motion. If you would like to try these cards, you can purchase the Stampin' Up! products from my on-line store or you are welcome to contact me for further information.